Probing, sinister and seductive, Nocturnal Animals is the second feature from fashion designer Tom Ford after A Single Man and this sleek beast marks a bold step forward in his evolution as a filmmaker. Amy Adams plays Susan Morrow, a wildly successful gallery owner living a superficially perfect LA life but suffering from a bad case of ennui. Susan is delivered a shot of adrenalin when she's sent the manuscript of a book by her ex Edward (Jake Gyllenhaal), a man she hasn't seen for the best part of two decades. As she devours it, we watch the narrative unfold alongside Susan's own story. The novel in question is the Nocturnal Animals of the title, a terrifying thriller which finds an everyman called Tony (also played by Gyllenhaal) plunged into a nightmare. After he's driven off a west Texan road in the dead of night, he's unable to prevent his wife and daughter being taken by a trio of rogues, led by Ray (Aaron Taylor-Johnson). In his attempts to track them down and enact vengeance, Tony is assisted by maverick detective Bobby (Michael Shannon). With its violence and real-life parallels, the book appears to be a cruel rebuke, and yet it awakens Susan from her slumber and she begins to contemplate where the relationship went wrong. Based on the novel Tony and Susan by Austin Wright, the screenplay has been crafted by Ford himself. It's ravishingly shot by Seamus McGarvey (Fifty Shades of Grey, We Need to Talk About Kevin) and, alongside stalwarts Adams, Gyllenhaal and Shannon (all superb), contains a surprisingly decent performance from Taylor-Johnson. If the satire of lives-less-ordinary feels familiar (we've seen similar in the recent Maps to the Stars and The Neon Demon) then the intertwining of this and a Last House on the Left style revenge plot betrays ambition. Moreover, it's executed with real panache as the stories switch, intersect and bleed masterfully, with the sterility of Susan's urban environs and the heart-racing horror of Tony's desert-set tale a satisfying contrast. There are nods to Vertigo here too in the mounting obsessions, while a further layer is added when we see Edward and Susan's relationship relayed in flashback. 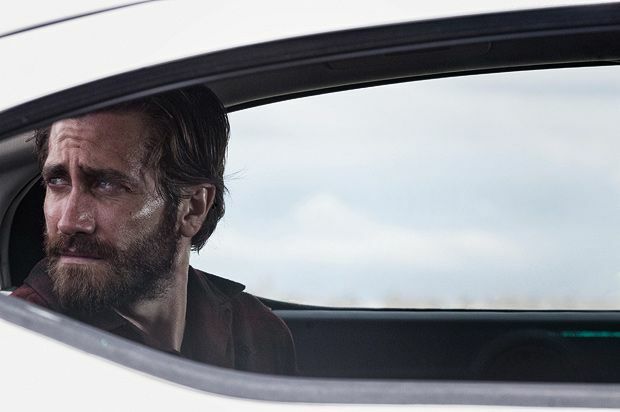 Nocturnal Animals is tense, intriguing and just the right amount of strange. It's a movie that explores the invigorating, engrossing impact of fiction – a beguiling creation that shows, appropriately enough, the way a great story can get right under the skin. Screened as part of the London Film Festival 2016. General release from Fri 4 Nov.
Susan (Adams) is a successful but bored LA gallery owner who is sent the manuscript of a book by her ex Edward (Gyllenhall), the titular Nocturnal Animals, which we see unfolding along with Susan's story. Ambitious, ravishingly shot tale exploring the engrossing impact of fiction; tense, intriguing and strange.